Allspice is the dried unripe aromatic fruit (berry) of the tropical American tree, Pimenta dioica (L) Merr., which is mainly produced in Jamaica. It’s production is confined to the New World, in Mexico, Honduras, Trinidad and Cuba. Efforts to grow it elsewhere have not been successful. It’s called ‘allspice’ because it’s flavour resembles a mixture of spices especially, cloves and black pepper. It also has hints of nutmeg and cinnamon. (The Oxford companion to Food). The fruits (berries) are harvested when green and dried in the sun. Once dried they become reddish-brown and smooth. The aroma in allspice comes from it’s essential oils, whose main constituent is eugenol. Eugenol is also found in cloves (oil of cloves), nutmeg, cinnamon, basil and bay leaf. An essential oil is an aromatic, volatile oil extracted from various plants like eucalyptus, orange or lemon peel, peppermint, lavender, coriander, basil, mint, black pepper, cardamom etc. Allspice essential oil is called Pimento berry oil. 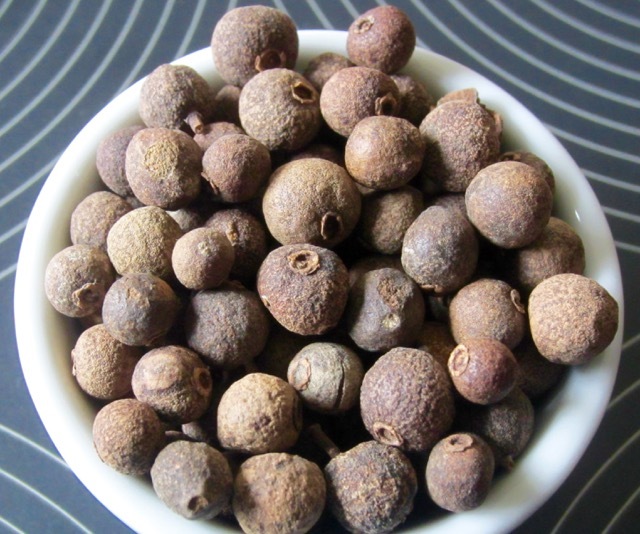 Allspice is used to flavour savoury and sweet dishes. It’s an important ingredient in Caribbean cuisine, in Jamaican jerk seasoning, and in the middle eastern cuisine. Allspice may be used whole, in pickles and marinades; or ground in cakes, puddings, desserts and cooked fruit. It’s used in commercial sausage production and as an ingredient in curry powder. It’s an ingredient Cincinnati-style chilli which is seasoned with cinnamon, allspice and cloves. It’s also used in the production of certain liqueurs such as Benedictine. Want to Read More about Allspice? 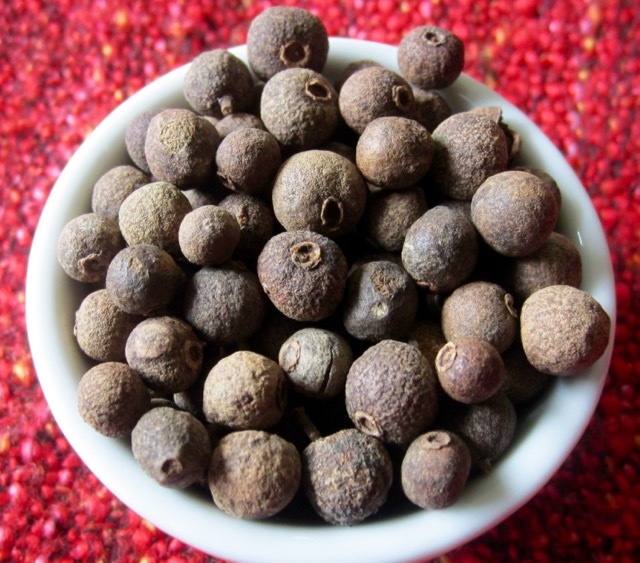 So What Exactly Is Allspice, Anyway? Here in France they have “quatre épices” which is usually a mix that replaces allspice. Also “piment de jamaïque” which I can sometimes find and I believe is the real thing. Yes that is the real thing. Bon weekend! I’ll need to move it closer to the front so I can remember to give it a shake. I have mine on the table right now. It will probably gather dust in the next four weeks. I will purposely google “recipes with allspice” and see if I can empty this bottle, soon. Have a lovely day! WOW! I didn’t know it was its own entity. Very interesting. I have a small bottle of it, but rarely use it except in gingerbread. Franky speaking, I also rarely use the berries, but from time to time, I use “a pinch” of ground powder in place of nutmeg.